Stop by the office today to tour our luxury apartment homes. Located in South End and neighboring Uptown Charlotte, Camden Gallery offers studio, one and two bedroom apartments with luxury finishes like stainless steel appliances, quartz countertops and upgraded cabinets. Just steps from your apartment you’ll enjoy the local flavor of unique dining and entertainment hotspots like Atherton Mills and Farmers Market. Opening soon right nextdoor, CoWork by Camden will offer the perfect space and amenities you need to work on your terms. No need for a car when you want to eat, work or play! When it’s time to stay in, you won’t be disappointed! Camden Gallery offers incredible amenities like a saltwater pool, on-site fitness center with virtual trainer and Yoga zone, as well as a bike workshop. Your apartment also includes conveniences like AT&T Uverse high speed internet, Wifi and cable, door to door trash service and full-size washer and dryer. Camden Gallery is pet-friendly featuring a Paw Spa and unleashed bark park. We’ve thought of it all so you don’t have to! Camden Gallery is in Historic South End, neighboring Uptown Charlotte and Historic Dilworth. Historic South End hosts numerous community events like Gallery Crawls, Food Truck Fridays, outdoor movie screenings and micro-brewery tastings. Camden Gallery is also walking distance to East/West Light Rail stations for easy access into Uptown for venues like Bank of America Stadium, BB&T Ballpark and Time Warner Arena. From your apartment, enjoy direct access to the Rail Trail for walking and jogging. 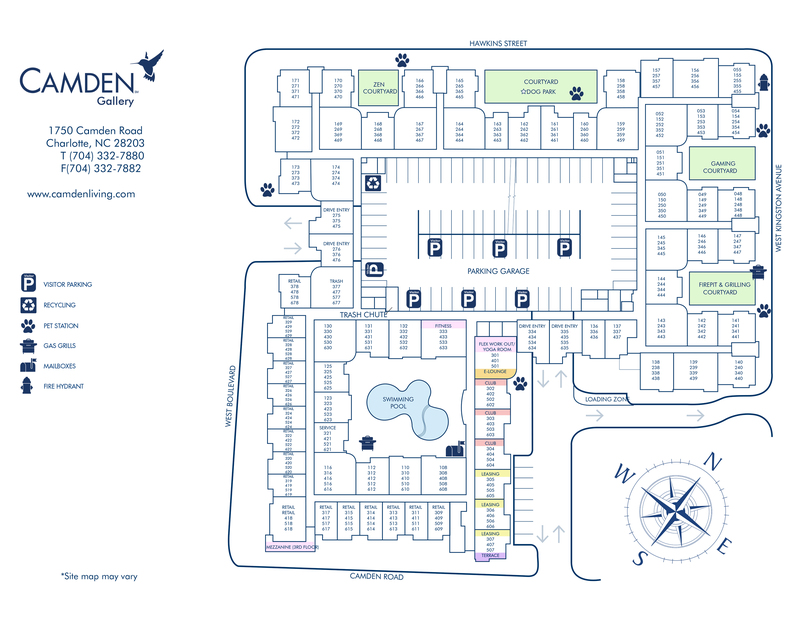 Camden Gallery is also walking distance to popular dining, retail and entertainment venues like Atherton Mills and Farmers Market, Sullivan's Steakhouse, Pike's Soda Shop, Tupelo Honey, and Tyber Creek Pub. Your Historic South End Apartment is less than 1.5 miles from Long's Animal Hospital and Publix Grocery. Plus multiple dry cleaners, drug stores, banks and grocery stores including Harris Teeter, a Target store, and the shopping and dining of the Metropolitan are all less than 3 miles away. The Carolinas Medical Center, Latta Park and Freedom Park are also a bike ride away. Residents receive a technology package included in the total monthly rent. This money-saving package includes high-speed internet and 300+ digital channels including DVR. Plus, this all-inclusive package includes access to the U-verse mobile app on any smart device. Looking for more options? AT&T allows you to upgrade any of their services like internet speeds up to 300 Mbps and additional channel packages. Living at Camden Gallery, you will want to explore your neighborhood at every turn. Come home to Camden Gallery today! AT&T Uverse technology package with high speed internet, wi-fi and cable. We'll save a spot for you! We offer up one parking space per Lease Holder in our parking garage for $10 monthly. Additional reserved spaces are $40 per space, per month. Contact Leasing Office for details.